While organizations struggle with pressures dictated by the ongoing economic downturn, lack of marketing resources, or the need to demonstrate a return from marketing campaigns, improving annual revenue through organic growth is increasingly a top goal for most organizations. 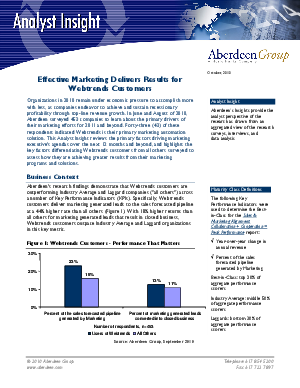 In this Aberdeen Group whitepaper, “Effective Marketing Delivers Results for Webtrends Customers,” the research demonstrates that leveraging certain process and organizational capabilities to support marketing efforts generates greater activity for an organization’s sales channel and drives overall business growth through higher lead conversion rates. The critical KPIs that drive success. The technology enablers that help marketers outperform the competition. How Polaris improved visibility into the performance of its digital channels, fueling an increase in lead conversions.